I found this scene on the property where my daughter boards her horse. I think I was pulled in by the similarities of both subjects. Both the door and the tree looked as though they had weathered a lot of life. Oh the stories they could tell! In creating the piece, I tried several techniques. Some of the clumps of leaves and grasses were rice paper glued on with acrylic matte medium and then drawn and painted on. The tree was covered in textured acrylic white gesso. I drew in the gnarly lines in the tree with black and brown waterproof ink and spritzed them with water while they were still wet. This causes the ink to run and create even more texture. I then went to work painting with watercolor and detailing the door. Just found a beautiful poem written about a tree on jRuthKelly’s Blog found here. Enjoy! Stephen Kellogg has been inspired to write a poem about this painting here. Thank-you Stephen! A couple weeks ago a fellow blogger offered his readers a spring challenge. 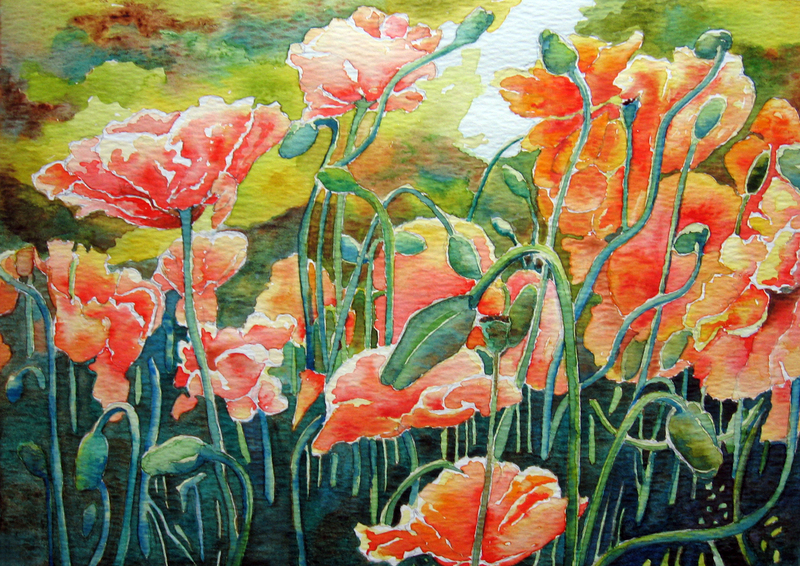 He posted a photo of poppies and asked us to join in and paint them in all our various styles. We were then to link to his post and leave a comment signifying that we had participated. Come and join in the fun and see everyone’s interpretations by clicking the artist’s tag names in his comment section. While painting this, I wondered how many other artists were doing the same this past week. I am so excited to see everyone’s versions! Thank-you Ryan for a wonderfully fun idea! The above was my first assignment for my first class in watercolor. 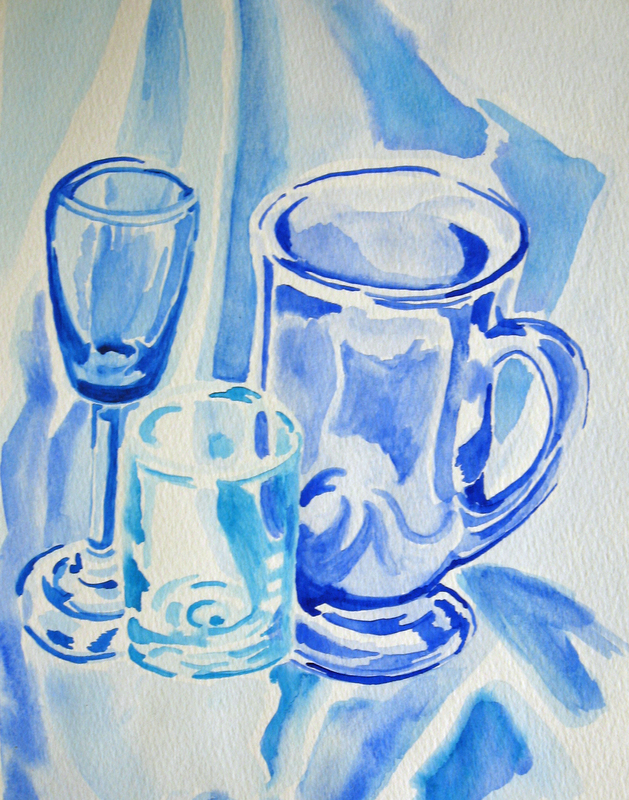 The instructor had asked us to do a study in varying shades of the same color and use glass objects. I was so frustrated and remember this was my fourth try and the one I went with. About the only thing I liked about watercolor was the feel of the brush sliding across the paper. I remember fighting the water and constantly wanting to wipe it up. The instructor continually reminded me that I needed to search for ways for the water to become my partner and not fight it so much. I believe it was about the third class I took when I painted this picture from a reference in a book of reference photos for artists. I made up the horses and painted them into the scene. 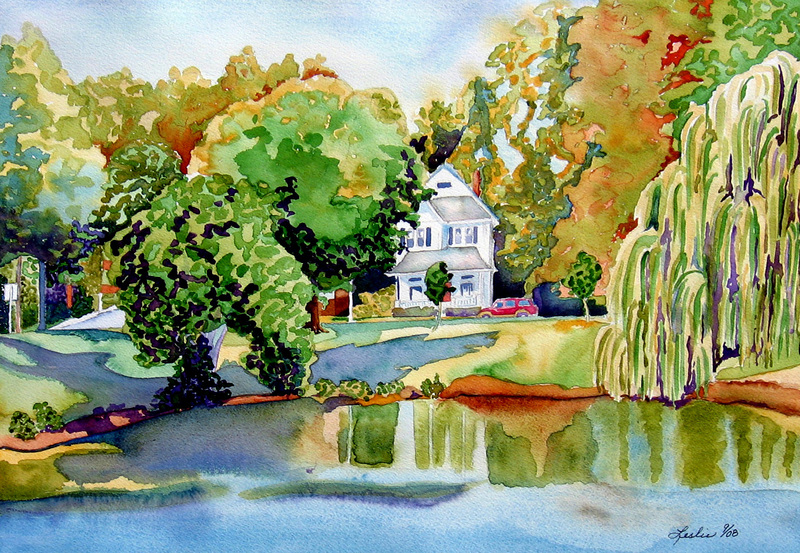 I have always considered this painting as my turning point and what spurred me on to continue to paint in watercolor. Meet my room mate, Lucy. You have met the other two already. They are Tucker found here and Payton found here. You might say I live in the dogs’ house most days. Lucy found her way here by terrorizing her previous room mate by barking too much and convincing her that she needed more space to run and play and just be a dog. I didn’t know, at the time, that Jack Russell was like no other breedof dog but an entity unto themselves. I am sure that Lucy came to live with me because I needed to learn patience. She barked, jumped straight up and down like a spring, hid under the lowest couch or chair, chased the vacuum, and was, literally, the opposite of my nature. However…..everyone who comes to visit LOVES LUCY! I painted this on 140 lb Cartiera Magnani coldpress paper. 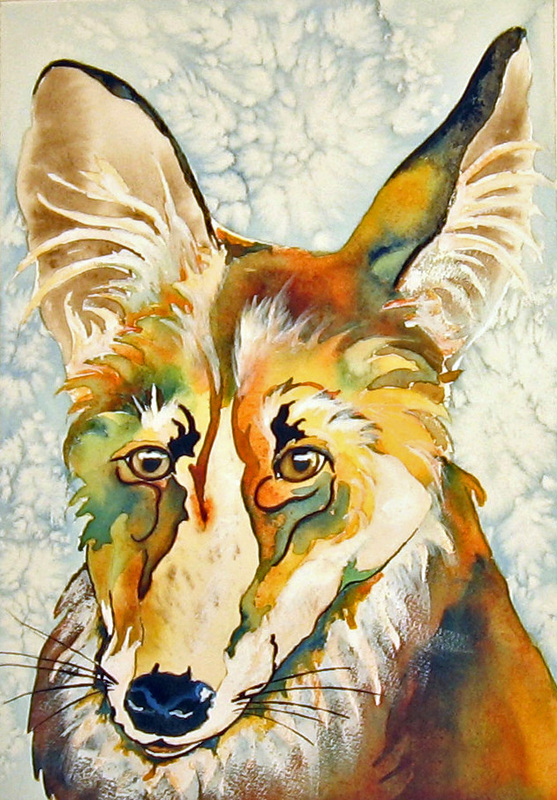 Thank-you, Tracey, for adding this paper to your e-bay shop. It has quickly become my second favorite paper! On March 2nd, blogger Yousei thanked me for the use of my painting for her banner as she had wanted something new at the top of her blog. Thank-you, Yousei. We e-mailed a little back and forth and the task of coming up with something pertinent, hopefully to her blog, became the next project I undertook. I repeat, I do NOT consider myself an illustrator. Designing a banner took some measuring skills as they are a certain size. Even as close as I tried to measure my watercolor paper, I still had to crop the above image a little on the bottom. I know. No big deal, but it was for me, Miss NON-TECHNICAL! Here is the thought behind the banner. Yousei’s blog is a writing blog, primarily poetry. You can check it out, here. She uses the name Yousei Hime which translated means “fairy princess”. Her blog name, Shiteki Na Usagi, stands for “poetic rabbit”. She likes blue bonnets. She was able to send me a picture of her favorite rabbit. However, the thought that came to my mind was that I don’t do princesses. 🙂 I searched through my drawings from life drawing and found a simple line drawing of a woman that I thought looked feminine and right for the part and drew her on the right side of the banner. I then went in search of “bunnies” in different positions as I was not too intrigued with just the idea of one rabbit and found a lovely assortment of poses I could use. I carefully placed her favorite rabbit looking at her. It is the little gold one facing her. I decided to keep the woman looking pensive as though she is hearing the rabbit speak to her through her mind’s eye. I rendered the other rabbits all in variations of the same color so they appeared to be of the same warren or family. I overlapped and entertwined their shapes, one atop the other, not unlike verse I hoped. The bluebonnets were rendered using pointillism in order to supply more color and variation. I first thought rabbits would be an easy subject material to work with, but not so. Other than their ears and eyes they are like an oval or a ball, neccessitating my search for the ins and outs of their form. I will return to trying to paint them again in the future. This is a painting I have spent the better part of my evenings painting for the last three weeks. It is from a picture that Carol’s husband, Matt, sent me. Carol’s blog is here. I have been fascinated with “all things” New York. I have never been there so am inquisitive about how things are done amidst all that concrete and tall buildings. I have asked numerous questions and both Matt and Carol have been kind and patient enough to answer them. Like shoveling snow? Carol sent me pictures of front end loaders loading the white stuff onto trucks and toting it off! I began by liquid frisketing all little white areas that I wanted to save on some of their patches and the metal door. 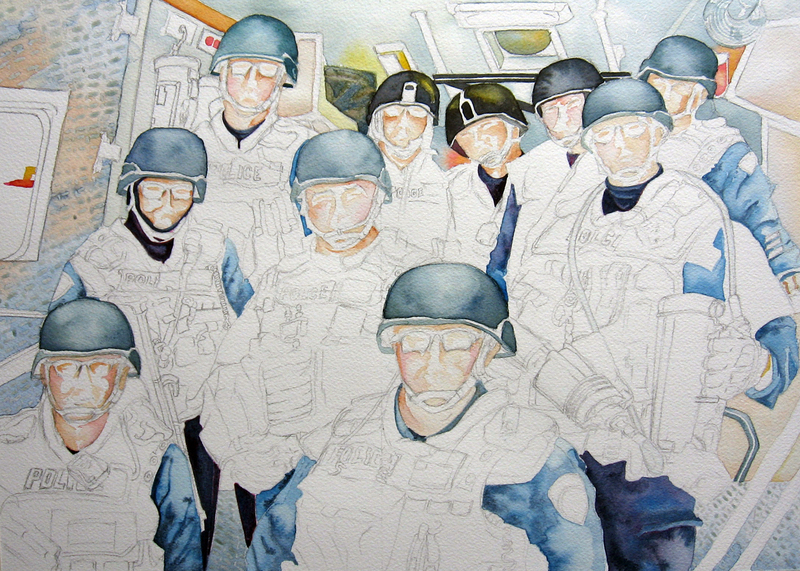 I painted the shadow shapes on the faces, the light areas of the surrounding truck, the helmets and then the blues. 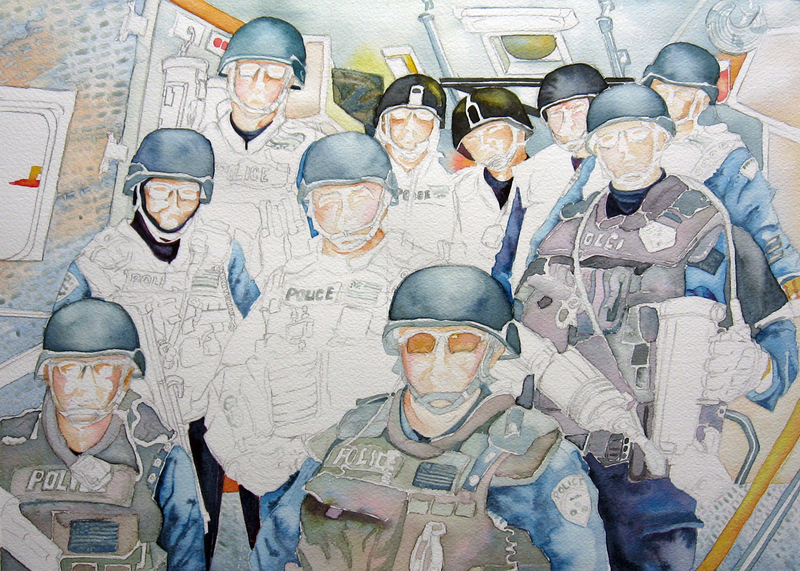 I wanted to set the blues down because the grays of the vests looked like a challenge and I knew they were a lighter value. Next came the vests. This was the most tedious part of the painting.I didn’twant them to appear flat, so I mixed the grays on the paper instead of the palette. I used varying shades of red, yellow and blue for the majority of the gray that you see and would occasionally drop in a light wash of green or violet. By the time I reached this stage I put the finishing touches on by detailing the faces, painting the tools and removing the frisket to end up with the painting at the top of the post. This is the most challenging painting I have ever attempted. 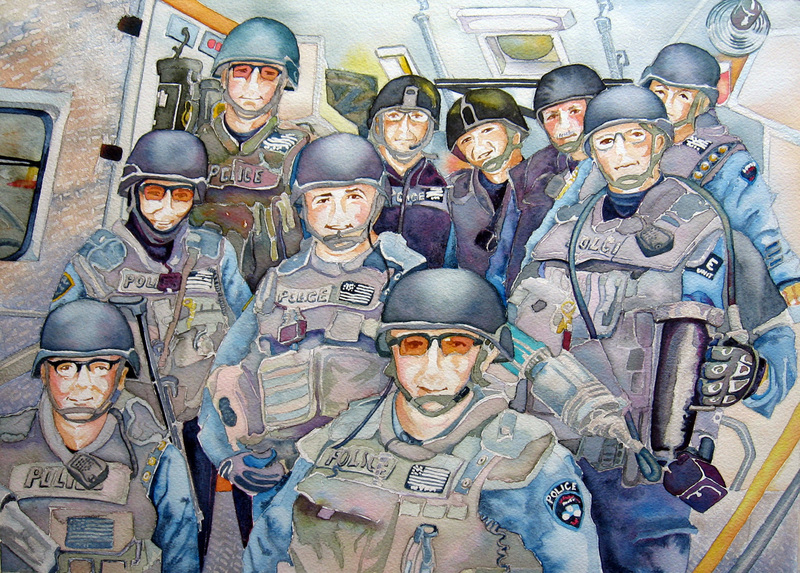 I chose it because it was different and I didn’t have a lot of familiarity with the subject material. 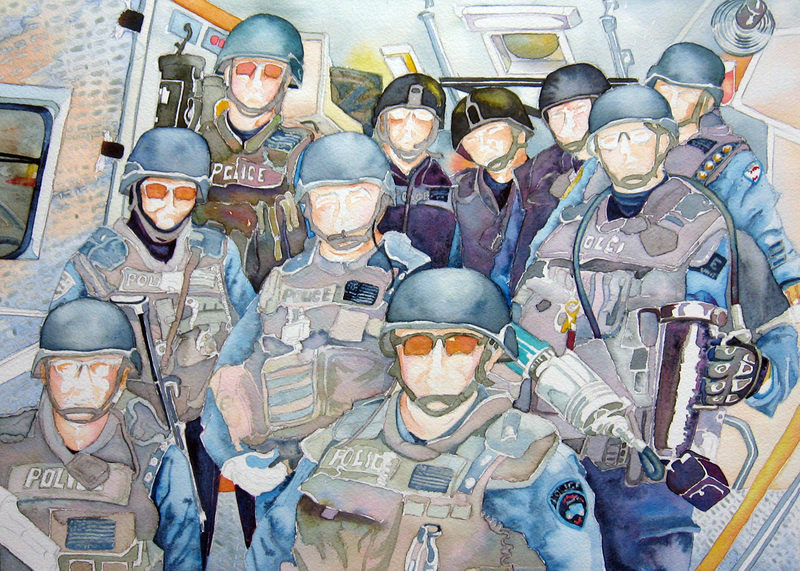 I have painted one or two people before but not a grouping. 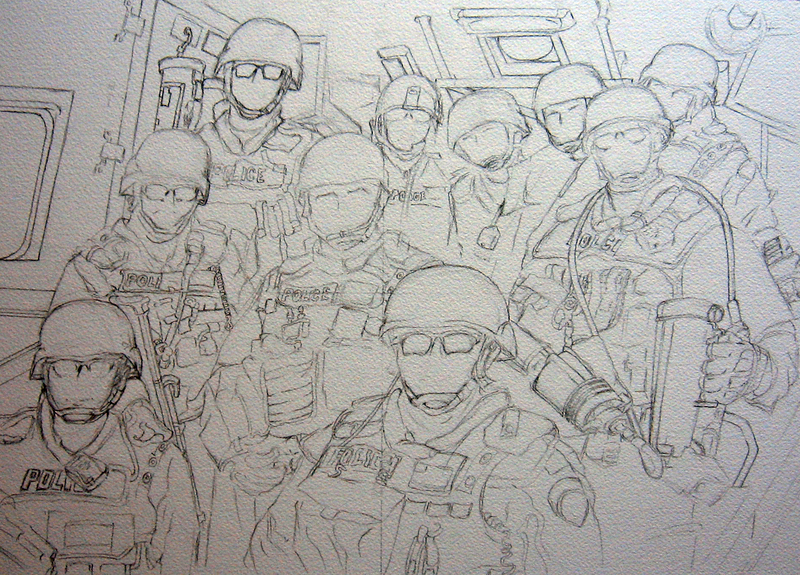 It was largely composed of grays and I also wanted to challenge myself with creating grays. I put this red fox away. Painted it a while back. I liked it but was embarrassed to share it. My mind got in the way and I started to do to myself what I tell my students not to do. There is no “bad” art. There is only “no” art. “No” art is when you tell yourself that what you create is “not good enough” and that something “looks flat” or that it is the “wrong color” or “I didn’t get the light right”. It is when you fill yourself with so many negatives you quit. That is “no” art. “Bad” art is “no” art. Ronny writes a post on “Ugly Art” here. There is always something special about painting outdoors. A year and a half ago I participated in a wet painting silent auction. 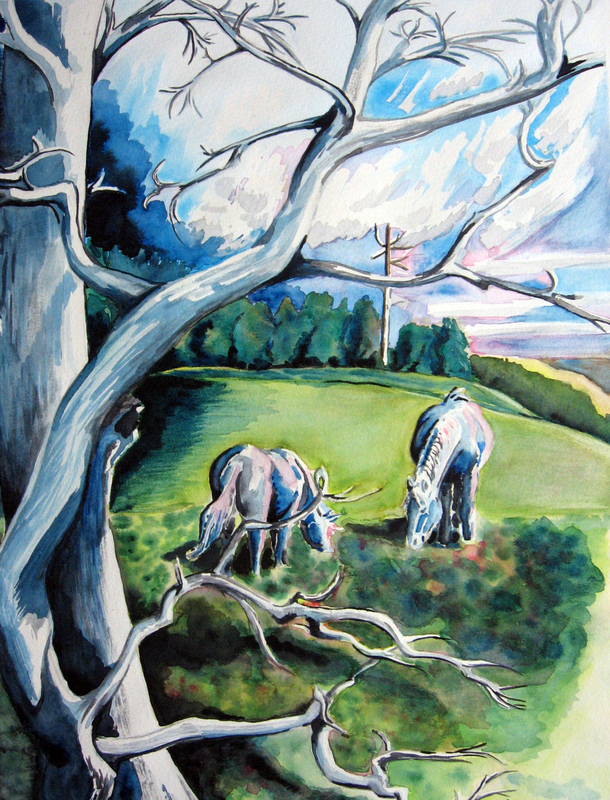 I painted two landscapes that day.The other is posted here. My paintings, done outdoors, always look different than the ones I paint from reference photos. I think we tend to pare down the non-essentials when we have a time limit. I feel the brightness of the light or absence of it and the experience of the moment is found in plein air painting. 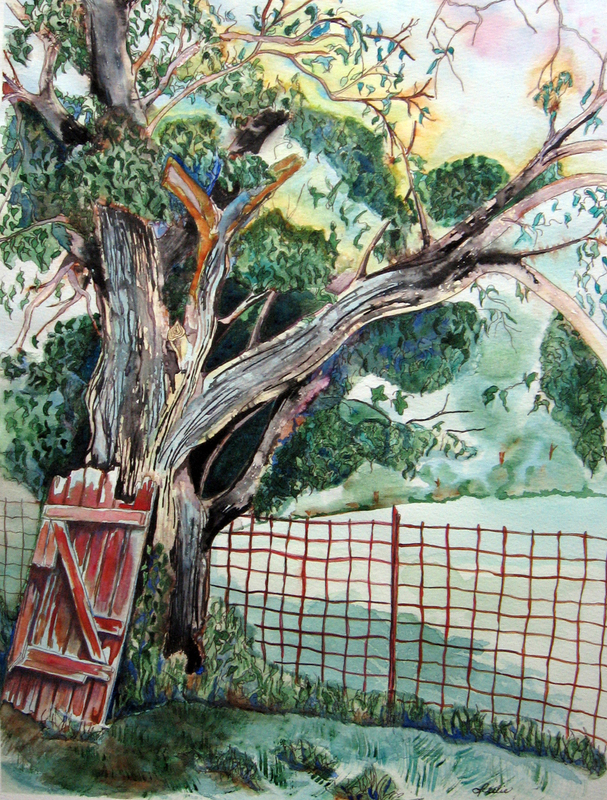 Many artists turn their backs on plein air work or work from life because they feel their work is less when they do so. Don’t do that to yourself, is my advice. There is something to be gained from both approaches. I have found that my work from reference photos helps my plein air work and vice versa. I strive to maintain a balance between the two. It is going to be getting warmer and I hope to take advantage of painting plein air again this summer.